been suggested as the template for magnonics. However, these structures cannot be used for high-frequency (terahertz) magnons, since terahertz excitations are governed by the interatomic magnetic exchange interaction and hence tunable lateral variations of exchange interaction on the atomic length scales is not feasible. Our idea is to suggest a way of designing atomic scale magnonic crystals for terahertz magnonics based on multilayer thin films. The central point of this project would be to experimentally design magnetic multilayers, composed of alternating atomic layers of ferromagnetic metals, in which different magnon modes can be efficiently excited. The sample preparation and all the analysis will be performed under ultra-highvacuum. 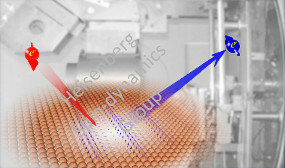 The magnetic excitations shall be investigated by our unique spin-polarized high-resolution electron energy loss spectrometer, recently launched at the Physikalisches Institut. Please contact khalil.zakeri@partner.kit.edu for details and applications.